At Coquina Beach, crews are out early using beach rakes to clear dead fish. The fish are dying because of a toxic algae bloom known as red tide. 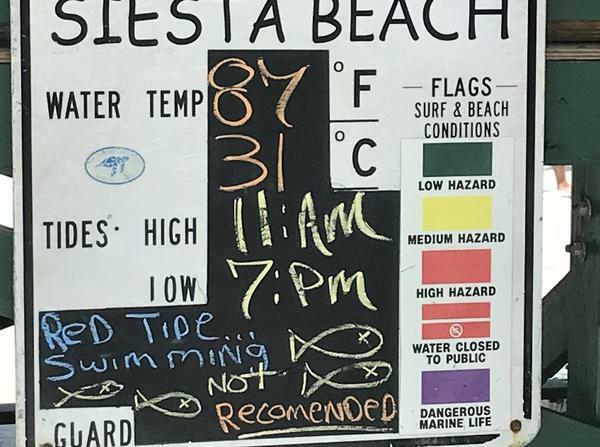 Many beachgoers at Siesta Key have been ignoring warnings that swimming is not recommended because of red tide. Scores of dead fish were visible on the shore of Manatee Beach on a recent morning. There was a smell from the fish, but something more — an acrid smell that can make you cough. Mary Vanswol, who was at the beach with her husband, James, said, "Uh, the smell is terrible. And it's affecting my lungs. I'm coughing, not so much him, but I am. It's just sad to see all the dead fish." The Vanswols live nearby and usually go swimming. But not today. After getting a look at the dead fish and the murky, slightly reddish-hued water, Mary Vanswols said they were leaving. "I wouldn't even walk along the edge of it. I just don't think it's safe," she said. The culprit is a microscopic organism called Karenia brevis. The algae are found almost exclusively in the Gulf of Mexico and occur naturally. Their reddish blooms were first noted in the Gulf by Spanish explorers in the 1500s. The algae produce a powerful toxin that, in high enough concentrations, can affect marine life and humans. There have been several red tide events in the Gulf over the past 20 years, but Vincent Lovko, a staff scientist at Mote Marine Laboratory in Sarasota, says this one is especially intense. "Right now, we're seeing counts that come into the category of high, which is over a million cells per liter. And that's pretty much all up and down the coast. There's somewhere between 100 and 150 miles of shoreline being covered right now." In Manatee and Sarasota counties, more than 100 tons of dead fish have been removed from the beaches. At Mote Marine Laboratory, biologist Rebeccah Hazelkorn says strandings of marine mammals and sea turtles have spiked recently. "You start to see baitfish wash up, then you see larger fish," she says. "Then you start to see your tarpon and your grouper. Then you start to see your sea turtles and your manatees. And the highest on the food web are the dolphins when it starts affecting those guys." So far, at least 12 dolphins are dead, more than 150 sea turtles, even a 26-foot-long whale shark — all, researchers believe, because of red tide. Another major problem is the aerosol the algae produce — an airborne toxin that can blow miles inland and causes respiratory irritation. That's been a particular problem on Longboat Key, where beachfront condos can cost millions. Isaac Brownman, Longboat Key's public works director, says his crews have removed tons of fish from the canals. But there's nothing they can do about the pervasive, irritating odor. "If people have an adverse reaction, we advise them to stay indoors. If they want to, visit the mainland, etc. That's just a matter of waiting it out, waiting for it to move offshore, " he says. Siesta Key, near Sarasota, bills itself as America's No. 1 beach, but it too has been hit by red tide. Crews are out early each day cleaning the beaches. But the water is murky. A sign posted says "Red Tide ... swimming not recom[m]ended." Even so, dozens of people are in the water. Jack Bossman was visiting from Holland with his family. "We were just debating on that," he says. "If we should stay or leave and go somewhere else. Because it's kind of yucky." Lifeguard Scot Ruberg says he has seen a few other red tides this bad in his 24 years on the job. He spends much of his day talking to visitors — many of them from other countries — about red tide. Ruberg says he tells visitors swimming is not recommended, but many do it anyway. "Most of these people, including myself when I was young, swam in lakes. I swam in the Mississippi River. It's just a matter of how healthy you are and how sensitive you are to it," he says. Ruberg says Siesta Key is still the gem of Florida's west coast. But because of red tide, visitor numbers are way down. He says about 6,000 or 7,000 people are usually on the beach on a weekday — today there are about 1,000. To Florida, the state declared a state of emergency this week because of a slow-moving natural disaster, red tide. Red tide is a toxic algae that has persisted off Florida's Gulf Coast for nearly a year. In recent weeks, the algae bloom has worsened, killing fish and turtles and dolphins. It's also affecting tourism on some of the state's most beautiful beaches. From Anna Maria Island, NPR's Greg Allen has our report. GREG ALLEN, BYLINE: Walking along the shore here at Manatee Beach, there are lots of dead fish here, all different kinds. There's a smell from the fish, but there's something even more. It's kind of an acrid smell that can make you cough. MARY VANSWOL: The smell is terrible, and it's affecting my lungs. I'm coughing. Not so much him, but I am. And yeah, it just - it's sad to see all the dead fish. ALLEN: Mary Vanswol planned a day at the beach with her husband, James. They live nearby and usually go swimming but not today. After getting a look at the dead fish in the murky, slightly reddish-hued water, they're leaving. VANSWOL: I wouldn't even walk along the edge of it. No, I just don't think it's safe. ALLEN: The culprit here is a microscopic organism called Karenia brevis. The algae are found almost exclusively in the Gulf of Mexico and occur naturally. They're reddish blooms were first noted in the Gulf by Spanish explorers in the 1500s. The algae produced a powerful toxin that in high enough concentrations can affect marine life and humans. There have been several red tide events in the Gulf over the last 20 years, but Vincent Lovko, a staff scientist at Mote Marine Laboratory in Sarasota, says this one is especially intense. VINCENT LOVKO: Right now we're seeing counts that come into the category of high, which is over a million cells per liter. And that's pretty much all up and down the coast. There's somewhere between a hundred and 150 miles of shoreline being covered right now. 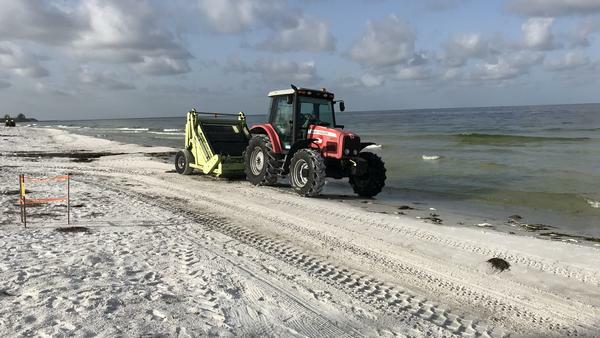 ALLEN: In Manatee and Sarasota Counties, more than 100 tons of dead fish have been removed from the beaches. At Mote Marine, biologist Rebeccah Hazelkorn says strandings of marine mammals and sea turtles have spiked recently. REBECCAH HAZELKORN: You start to see bait fish wash up. Then you see larger fish. Then you start to see your tarpon and your grouper. Then you start to see your sea turtles and your manatees. And the highest on the food web is going to be the dolphins when it starts affecting those guys. ALLEN: So far, at least 12 dolphins are dead, more than 150 sea turtles, even a 26-foot-long whale shark, all researchers believe because of red tide. Another major problem is the aerosol the algae produce, an airborne toxin that can blow miles inland and causes respiratory irritation. That's been a particular problem on Longboat Key where beachfront condos can cost millions. The public works director there, Isaac Brownman, says his crews have removed tons of fish from the canals, but there's nothing they can do about the pervasive, irritating odor. ISAAC BROWNMAN: You know, if people have an adverse reaction, we advise them to stay indoors, if they want to, visit the mainland, et cetera. You know, that's just a matter of waiting it out, waiting for it to move offshore. ALLEN: Siesta Key near Sarasota bills itself as America's No. 1 beach, but it, too, has been hit by red tide. The smell's not bad on this day, and there are few dead fish. Crews are out early each day cleaning the beaches, but the water is murky. A sign posted says, red tide, swimming not recommended. Even so, dozens of people are in the water. Jack Bossman was visiting from Holland with his family. JACK BOSSMAN: We were just debating on that - if we should stay or leave and go somewhere else because it's kind of yucky. ALLEN: Lifeguard Scott Ruberg says he's seen a few other red tides this bad in his 24 years on the job. He spends much of his day talking to visitors, many of them from other countries, about red tide. SCOTT RUBERG: We can tell them not - it's not recommended, but if they want to do it, they - most of these people, including myself when I was young - I swam in lakes. I swam in the Mississippi River. It's just a matter of how healthy you are and how sensitive you are to it. ALLEN: Ruberg says Siesta Key is still the gem of Florida's west coast. But because of red tide, visitors are way down. He says about 6,000 or 7,000 people are usually on the beach on a weekday. Today there's about a thousand. Greg Allen, NPR News. Transcript provided by NPR, Copyright NPR.